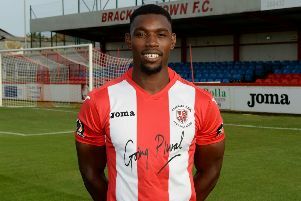 Brackley Town lost ground in the Vanarama National League play-off race as they dropped two points at Leamington. Late goals conceded in each half cost Kevin Wilkin’s side dear on an afternoon when all the teams around them lost as Saints and Leamington drew 2-2 in a dramatic Boxing Day contest. Leamington took a 44th minute lead when Colby Bishop headed home powerfully from Kieran Dunbar’s right-wing cross in an otherwise forgettable first half. Glenn Walker drilled a free-kick past keeper Tony Breeden to level three minutes after the restart following a foul on Matt Lowe. Shane Byrne’s free-kick from a similar position was close and Aaron Williams’ determination won possession and his fierce shot was scrambled clear as Saints dominated. Saints deservedly went ahead in the 76th minute as Jimmy Armson made ground and slipped in Matt Lowe whose shot was only pushed away by Breeden, allowing Williams to follow up and apply the finishing touch for his 22nd goal in 26 games. Williams had two further chances to add to the score, Armson’s effort won only a corner and Lowe’s surging run brought a shot just too high. Without a second half shot on goal, Leamington staged an added-time rally. Four minutes into stoppage-time Jamie Hood’s header brought the best from Danny Lewis conceding a corner from which Hood was credited with the equaliser although the final touch was off a Saints’ player.